With no documents, no salary, no assistance, no rights. 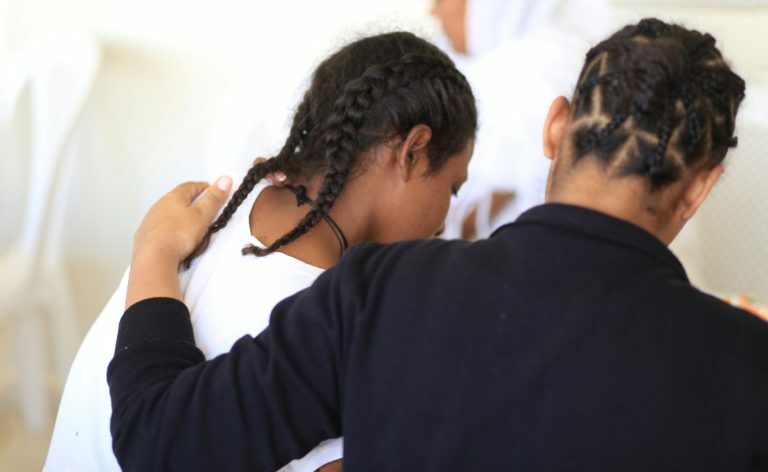 They often suffer abuse and they have their dignity trampled on: each year many migrant women, especially Ethiopians, come to Lebanon in search of work. But their hope soon turns into a nightmare. Project objective: to provide shelter and medical, psychological and legal assistance to women trapped in Lebanon, by providing them assistance until their return to Ethiopia and to other countries of origin. Aziza is 27 years old and comes from Ethiopia. Like many other women, she left in 2016 to seek her fortune – a job and a better life. She left behind her husband and two young children. However, the hope of a brighter future soon turned into a nightmare: in Lebanon her documents were taken away from her, preventing her from returning to her country and plunging her into illegality. She has never seen the promised salary. She has been the victim of abuse and violence. She has never been able to return to Ethiopia. Having fled from her jailers, she has found refuge in a reception centre, where she spends her days wearily waiting. She does not smile, her big eyes are sad and she is very homesick. She is waiting to go back. She has been waiting for 2 years. Lebanon is one of the main destinations for migrant workers, especially women. Every year they come in their thousands, more than half Ethiopians. With the hope of a better future, they leave their land, their home, their family, often young children. However, as soon as they cross the border, their hopes are shattered and they remain stuck in the kefalasystem: they become prisoners and slaves of their employer, who guarantees the legality of their stay in front of the State. Their documents are seized, they are often victims of abuse and violence, in many cases they are not paid and they are obliged into forced labour, with no rights. Some of them manage to escape and find a place of refuge in shelters, the centres for migrant women workers. CELIM aims to help and protect the women who have become involved in this migration cycle, by providing assistance from Lebanon through to their return to Ethiopia and other countries of origin. In the Olive, Pine and Laksetha shelters in Lebanon operators work to give back a dignified existence to the women who have escaped from their jailers. Hot meals are distributed and medical and psychological assistance is guaranteed: many migrants suffer in fact from post-traumatic disorders and need help in processing their trauma. In addition to this, legal assistance is provided to recover their unpaid wages, their documents and the possibility of repatriation. In the reception centres Aziza, and many other women like her, find their identity again and, little by little, even a little hope. Sometimes they start smiling again. Following the initial reception and assistance in Lebanon, the women and their families follow a path towards voluntary repatriation and reintegration into their countries of origin. Within three years, we intend to host and help over 1,500 women in the shelters of Beirut and 30,000 women inmates in Adlieh prison. Professional training courses are being organized in Ethiopia that teach about the women’s rights and enable them to build a life using their own resources. My name is Antonio Buzzelli, I'm 28 years old and I'm the project manager in Lebanon. The project aims to ensure and strengthen the protection and assistance network for 1500 women who have become involved in the migration cycle from Lebanon through to their return to Ethiopia and other countries of origin. CELIM helps strengthen the means of protection of migrant women’s human rights and improve the management of migratory flows.